BROOMALL, Pa. | No getting around it -- the news has an agenda in this suburb of Philadelphia. The stories are fun. The reporters are short. And most of the production team has Asperger's syndrome. This is Action 7 News -- a product of the Asperger's support program at Worrall Elementary School. Teachers here say that producing a newscast is one of the best ways for these students to learn how to speak clearly, work together, build confidence ... and become school celebrities at the same time. The newscast is about to begin, so click play on the video above for the full report. BETTY ANN BOWSER: It was straight to the top for Donato Tocci. At 11 years old, he's already a television news anchor. And he's about to go live. BETTY ANN BOWSER: News has an agenda at Worrall Elementary School in Broomal, Pa. The reporters aren't simply young and driven, they also have Asperger's syndrome. Children with this form of autism often have trouble with social cues like facial expressions and gestures ... and working well with others. MICHAEL RIZZO: I said Mona Lisa! BETTY ANN BOWSER: And that's the very reason Asperger's specialist Randi Rentz and speech pathologist Kristen Dercole developed this newscast. They wanted their students to see the world from another angle. RANDI RENTZ, Asperger's specialist: A lot my kids are very black and white so to speak where they dont understand the middle area the grey area and you know they may know happy, they may know sad but they dont know the difference in between. BETTY ANN BOWSER: And television journalists -- even miniature ones -- need to watch themselves from time to time to think critically about how they present themselves ... especially how they sound. KRISTEN DERCOLE, speech and language pathologist: I think that reporters in general are really good role models for students as far as good speaking skills. We always talk about how to be on a newscast, you have to over-enunciate. TUSHAR NARAYAN: His owner, Mike Schelin, even takes him on cross-country races. DERCOLE: You have to slow down your rate of speech. AARON THOMAS: ... largest mass transit system in the world. DERCOLE: You have to really work on your pitch. HANNAH COATES: ... largest chocolate bar ever made. DERCOLE: You want to emphasize key words. DONATO: In Sports News, Jeter hits 3,000! DERCOLE: So theres a lot of different parts of speech that you can work on while you work on the newscast. AUGIE PANTELLAS: "The homer was Derek's 3,000th baseball hit..."
BETTY ANN BOWSER: That's Augie Pantellas, reporting the latest in sports. When his mother Michelle learned he had Asperger's and would need treatment, this isn't exactly what she envisioned. MICHELLE PANTELLAS, parent: So I was a little angry when I first, you know, met everyone here and a little frustrated. I was scared for my son, but I think that being in the program for six years has changed the course of his life. I mean, the skills that he's learned ... coping skills, strategies, just how to react to people and how to read people. BETTY ANN BOWSER: It's a good perk. But the journalists themselves can think of a better one. When the half-hour broadcast is complete each year, the whole school gathers to watch. MICHAEL: Well I guess my favorite part about Action 7 is getting to do all of the other skits and letting your friends envy you. BETTY ANN BOWSER: Even Donato, the anchor, feels it. DONATO: I've never been this famous before. BETTY ANN BOWSER: For children with Asperger's -- kids who often stand out from the rest of the crowd -- that feeling can be, well, monumental. RENTZ: One year I was over at the middle school. And there was a huge, huge difference with the kids who had been through the program socially not just with their confidence but with their social skills overall as a whole. BETTY ANN BOWSER: At the moment, Action 7 is the only program of its kind in the nation ... at least as far as Randi Rentz knows. But she also believes that shining this kind of spotlight on kids with Asperger's could be a good approach for any school. For the PBS NewsHour, I'm Betty Ann ... No, wait ... let's let one of them do it. 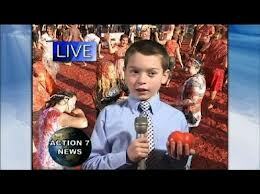 AARON: Reporting live from the red streets of Spain, I'm Aaron Thomas for Action 7 News.